Protection and grazing ground for the cows are among the essential needs for society and the welfare of people in general. The animal fat required for the human body can be well derived from cow's milk. Cow's milk is very important for human energy, and the economic development of society depends on sufficient food grains, sufficient milk, and sufficient transportation and distribution of these products. Lord Sri Krsna, by His personal example, taught us the importance of cow protection, which is meant not only for the Indian climate but for all human beings all over the universe. Less intelligent people underestimate the value of cow's milk. Cow's milk is also called gorasa, or the juice from the body of the cow. Milk is the most valuable form of gorasa, and from milk we can prepare many important and valuable foodstuffs for the upkeep of the human body. The killing of cows by human society is one of the grossest suicidal policies, and those who are anxious to cultivate the human spirit must turn their attention first toward the question of cow protection. PURPORT: When Krishna was saved from such a great danger, mother Yashoda and Rohini were principally concerned, and the other elderly gopis, who were almost equally concerned, followed the activities of mother Yashoda and Rohini. Here we find that in household affairs, ladies could take charge of protecting a child simply by taking help from the Cow. As described here, they knew how to wave about the switch of a Cow so as to protect the child from all types of danger. There are so many facilities afforded by Cow protection, but people have forgotten these arts. The importance of protecting Cows is therefore stressed by Krishna in Bhagavad-gita (krisi-go-raksha-vanijyamvaisya-karma svabhavajam [Bg. 18.44]). Even now in the Indian villages surrounding Vrindavana, the villagers live happily simply by giving protection to the Cow. They keep Cow dung very carefully and dry it to use as fuel. 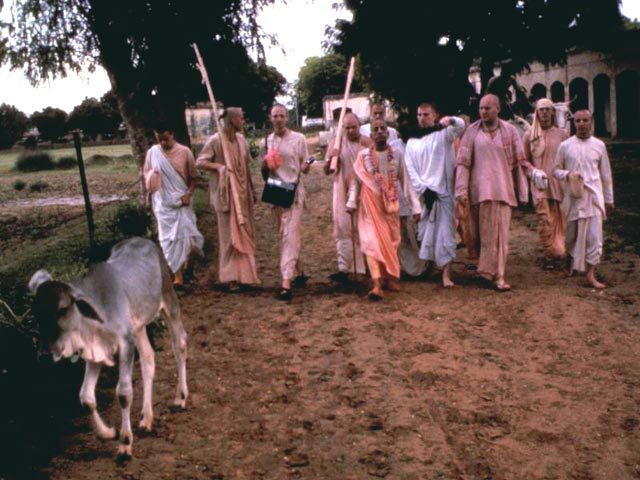 They keep a sufficient stock of grains, and because of giving protection to the Cows, they have sufficient milk and milk products to solve all economic problems. Simply by giving protection to the Cow, the villagers live so peacefully. Even the urine and stool of Cows have medicinal value.